← Chicken, Mushroom and Asparagus pie!! This wonderful interpretation of the chocolate cake came to me thanks to the lovely, genuis of Indigo whole foods, an independent health/organic food shop in my native Moseley. Full of healthy non chemically tampered with goods, this shop is but one of the independent food shops in this wonderful part of Birmingham. Upon perusing the shop and all of its wonders I came across convienience food at its finest, in the form of ground hazlenuts. Something I have never set eyes on (sold in this form) before, I snapped them up, dreaming of the lovely incarnations this ingredient would become. Time to put on my thinking cap. Hazelnut and chocolate is a no brainer, Nutella anybody??? With chocolate cake for me being oh so drab, what better remedy than a generous helping of nuts to impart their wonderful, nutty, natural oiliness to the dry and dreariness that can all to often be, chocolate cake. I decided to use a combination of ground almonds and ground hazelnuts in the place of flour, meaning this cake is gluten free (egg whites whipped within an inch of their life are the raising secret agents). This being a happy by product of me wanting the nutty texture, hence gluten free being in brackets. I did not set out to make a gluten free cake, it just turned out that way, which is great for everyones stomach, too much wheat cannot be a good thing! Gluten free does not automatically spring delicious to mind, but trust me this is. By the way this is called a Mocolate cake because I’ve sneaked in a bit off coffee, giving a lovely balance of flavours. Turn oven on to 180 C. Melt chocolate in a bain marie (bowl over simmering water- water must never touch bowl!!) Cream butter and sugar until lovely and fluffy. Add yolks, nuts, chocolate, coffee. Mix, mix, mix!! Whisk egg whites until stiff. Gently fold in. Cook for around 20 mins (or until done). Serve with whipped up cream. This is a cake that doesn’t have to be tarted up to be good (and it is on more than one level). Oh yeah and did I mention, high in protein!!! Nom, nom!!! Please note- the picture is not my own, I had guests when this was made so, caught up in the excitement, I stupidly forgot to take pictures ! 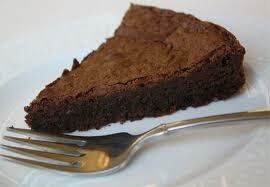 This picture is courtesy of google images- a true likeness of the cake and its wonderful texture.